Looking to build your list and turn raving fans into paying customers? Whether you sell a product or a service (or both! ), you need a dependable and personal way to regularly engage with your right peeps. But are you struggling to build a fan base beyond your mom, best friend, and a handful of past co-workers? Let alone successfully convert any prospects into paying customers? Say so long to the lonely, desperate cry, “Helloooo is there anyone out there???? !” and start attracting your perfect peeps with a clear message, compelling content, and consistent communication. Building your community doesn’t happen overnight. But authentically fostering relationships over time can lead to devoted followers and then loyal customers. In this self-paced module, I share the approaches and practical tips I used to cultivate connection and grow my list by the thousands. 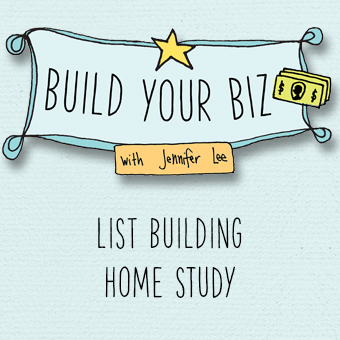 I can’t wait to show you how in the Build Your Biz: List Building Home Study! If you’re just starting out in your business, it can be challenging to sell your products and services when you don’t have a following. The teachings, exercises, and examples in this module will guide you through how to start building relationships with your perfect peeps so that you can cultivate connection and turn your fans into paying customers. If you’ve been in business for awhile but are still having trouble reaching your right people, filling your programs, or regularly connecting with your subscribers, this module will help you overcome your blocks around sending your newsletter regularly. You’ll get ideas for content, you’ll be inspired by our case studies, and my top-secret inside peek into my list growth will show you what’s possible over time. Plus, I also cover a couple more advanced ways to engage with your list for more targeted communication. How is this List Building module different from your other courses? The List Building Home Study module is part of the Build Your Biz suite of modules. 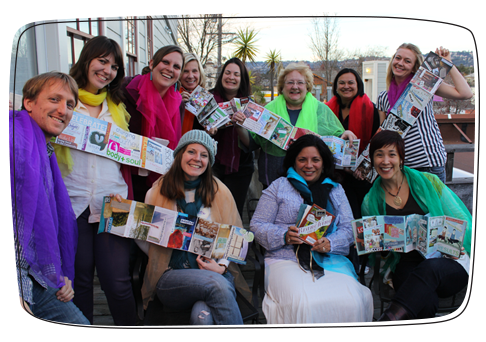 These Build Your Biz Home Study modules are a good fit for creatives looking to grow an existing business. You already have a sense of what your business is and who you serve but you’re struggling with making sales, you’re uncomfortable marketing yourself, you’re frustrated with your finances, you’ve been stuck in the same place for awhile or you’re burnt out from doing too much. The List Building module specifically helps you with authentically growing your list of subscribers and engaging with your fans through a regular newsletter. The Product Development Playground Home Study helps you turn your special gifts, teachings, and know-how into tangible or digital products like an e-Book, e-Course, audio or video series, program, summit, kit, or other creative product so you can impact more people around the world, in less time, and make more money. The Product Development course specially covers taking an idea from concept, prototyping, testing, producing, and launching.